A new look for Agastache, the Blue Boa offers long deep violet blue flower spikes against beautiful green foliage. Also, known as hyssop and hummingbird mint, this agastache is a fast growing upright clumping perennial. The Blue Boa Agastache produces fragrant blooms from June through September in full sun. 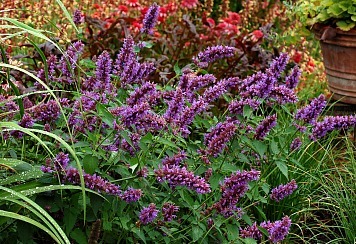 Drought tolerant once established, hyssop grows well in well drained to dry soil. Plant your Blue Boa Agastache in full sun with other seasonal flowering perennial plants and ornamental grasses to attract butterflies and hummingbirds. Spreading up to 24 inches wide, this blue flowering perennial grows up to 30 inches tall. Perfect companion plants include Morning Light Maiden Grass, Denver Daisy Rudbeckia, and Echinacea Summer Sky. Hummingbird mint is a great deer resistant perennial plant choice for butterfly gardens. Orders shipping to AZ and CA addresses will be bare rooted and root washed before being prepped for shipping.